Japan is covered up and down with thousands of onsens (hot natural springs), around which numerous spa resorts are popping up. If you are in Tokyo in the near future, don’t miss a chance to relax at the Yunessun Spa Resort. Famous for its theme park with exotic baths and traditional open-air hot springs with a view, Yunessun has something for everyone. 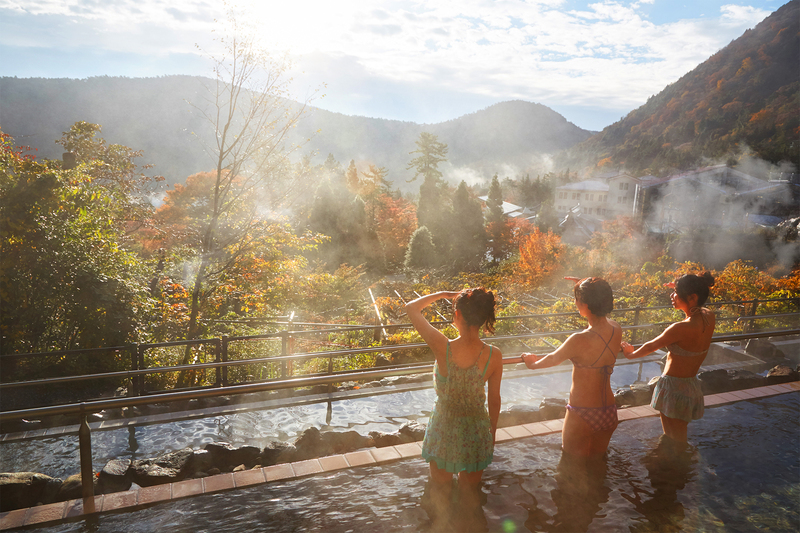 Lying at the foot of scenic mountains and surrounded by lush greenery, the Yunessun Spa theme park is an ideal getaway from nearby Tokyo when you need to spend a few hours soaking in thermal waters. The park offers the most unconventional spa treatments, catering to all tastes: from a traditional hot spring experience to exotic pools filled with weird liquids such as coffee or wine. The resort is divided into two parts – the Yunessun Spa Resort (a swimsuit zone) and the Mori No Yu (“no clothes”) area. The latter is a space offering more conventional spa treatments, with separate areas for women and men. 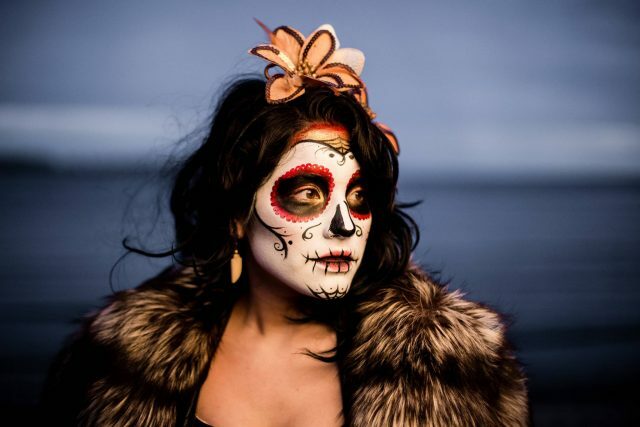 Don’t be misled by skeptics: the themed baths in the park aren’t just filled with dyed water. 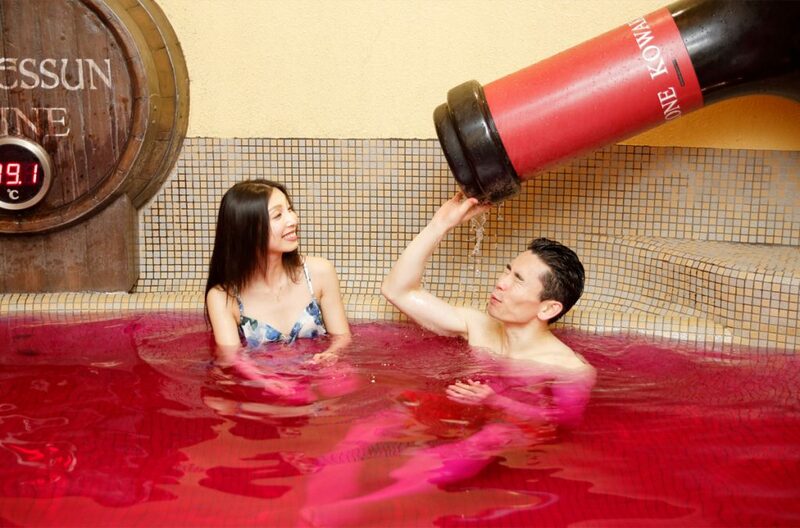 If they say you’re bathing in wine, you’re bathing in wine! Herein lies the essence of the fun. Besides soaking in the baths, you can enjoy Rodeo Mountain, an outdoor pool with a big water slide. If you come to the park with children, be sure they will find something fun like this to do while you are relaxing in the huge tub of wine. You may ask, which are the most exotic baths you can dip in? In my humble opinion, the most bizarre bath you can take is the Ramen Bath. How does the meat broth affect your skin and health? No one knows for sure, but such an experience may arguably bring a lot of joy. No worries if soaking in meat broth isn’t your thing. You can choose a different way to relax in thermal waters: for example, Coffee Bath, a tub filled with fresh home-brewed java. What are the health benefits? Soaking in coffee rejuvenates the skin and eliminates fatigue. A huge wine bottle lies next to the pool, filling it with red wine. Soaking in this bath protects your skin from environmental damage due to the high level of antioxidants contained in wine. As a nice bonus, all the guests are offered a glass or two of the wine. How about swimming in a tub of green tea? For tea lovers there’s an opportunity to relax in bright green thermal water that detoxifies your body and strengthens your immune system. Another highlight of Yunessun is the Chocolate Bath, a true paradise for those with a sweet tooth. It’s the one case where chocolate does no harm to your waist, but gives benefits to your health: twenty minutes of soaking in a tub filled with chocolate rejuvenates your skin and elevates your mood. If you’re looking for a more traditional Japanese hot spring experience, consider relaxing at the Mori No Yu (“no clothes”) area. It has a stunning view over the mountains and offers a wide selection of tubs where you can zen out after experiencing the Yunessun area. One of the most popular pools at Mori No Yu is God’s Aegean Sea, which consists of three islands with thermal waters and offers numerous massaging devices. Access: It takes 35 minutes to get to the resort by traveling from Tokyo Station to Odawara Station by Shinkansen (a bullet train) or an hour and a half by regular train. From there take a bus, and in 40 minutes you’ll arrive. Admission: Once you pay admission, you’ll get a waterproof digital wristband, which acts as the key to your locker and as an electronic purse. Note that people with visible tattoos are not allowed into the baths. First you need to get to Tokyo, and the best way to reach the city on miles is to book a flight through United’s frequent flier program. If your dates are flexible, you may be able to get a cheap one-way Saver award ticket that requires only 35K MileagePlus® miles. If your dates are not flexible, book an Everyday award ticket that requires 80K award miles. Choose any of United’s rewards credit cards with a sign-up bonus that is sufficient for covering your trip to Tokyo. 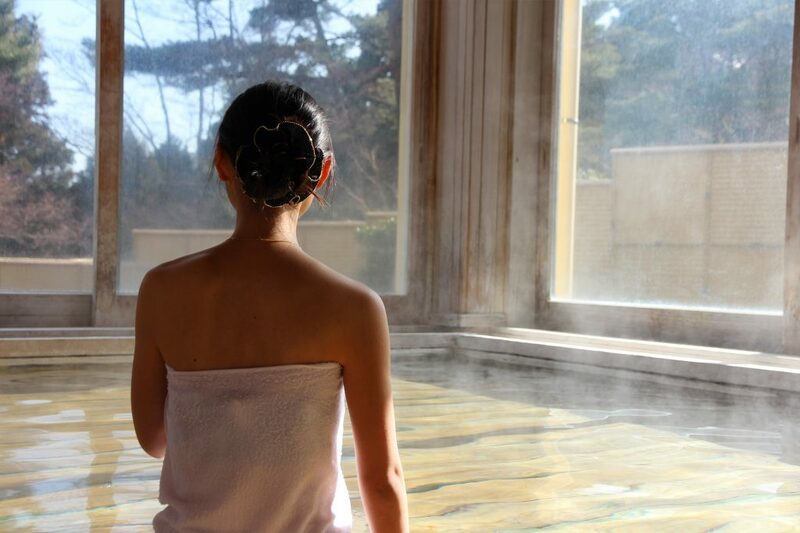 If you’re planning a trip to Tokyo, try to devote at least a half day to the Yunessun Spa resort. The Japanese know how to have fun and relax after an exhausting work week. Follow their example to get an unforgettable experience of chilling out in thermal waters and experiencing all the famous theme park has to offer.